On November 6th, the record labels Hypnotic Dirge Records and Throats Productions are releasing a new split together. 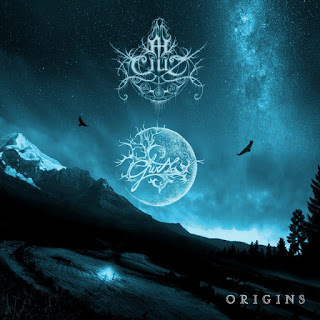 Origins, as it is called, will contain music from the atmospheric black metal bands Ah Ciliz and Chiral. I already know Chiral’s music, but this will be my first time listening to Ah Ciliz. Curious! Ah Ciliz started in 2008 as a solo project of Elmer, but nowadays Boris Iolis takes care of Ah Ciliz’s vocals. You might know Boris Iolis from L’Hiver en Deuil, Marche Funèbre and/or Soul Dissolution. Marco Ceccarelli, Ah Ciliz’s drummer until 2014, can also be heard as guest musician on the first Ah Ciliz track of this split, Cascadia. Musically Ah Ciliz produces very nice atmospheric black metal, but it can be heard that variation is also something they think is important. The whole Ah Ciliz-part as well as each track on its own gives us many musical changes, so it definitely won’t get boring. The second track, titled Moonlight In Night Season, let’s us hear the more relaxing side of Ah Ciliz. This folky, ambient interlude between the other two Ah Ciliz tracks, Cascadia and People Of The Stars, makes you focus even more on those. Moonlight In Night Season on its own however is also really worth it. After a short musical build-up in People Of The Stars Ah Ciliz will go full-speed once more for now. My first time listening to Ah Ciliz was definitely worth it, with People Of The Stars being my favorite. The second band on this split is no stranger to me. I already wrote reviews of his albums Abisso (here, together with an interview), Where Mountains Pierce The Nightsky (here, split with HaatE), Sed Auiis (here, split with Nebel Über Den Urnenfeldern and Eternal Spell), Snow/Heritage (here), Gazing Light Eternity (here) as well as a compilation he was part of (In Metal We Trust Vol. 1, here). I also mentioned him in the second part of Promoting Bands (here). Of course it’s about Chiral, the one-man atmospheric black metal band from Italy. While Ah Ciliz has three tracks on this split, Chiral has two tracks. Looking at the length of both parts it barely makes a difference, because Chiral’s second track, Queen Of The Setting Sun, gives you a 15-minute experience. First Chiral unleash A Feeble Glare Of Autumn, a track you might have heard already, because it’s streaming for a while now on Chiral’s Facebook page. While A Feeble Glare Of Autumn is instrumental, you aren’t going to miss any vocals, because it’s being a really great track as it is now. The electro-sounds are a special surprise, they fit in really nice. They are perfect for leading in its ambient-sounding end. After A Feeble Glare Of Autumn, it’s time for the long Chiral track, Queen Of The Setting Sun. The dark, slow start of it immediately captivates you to be, after the addition of choir-like vocals, dragged in the unleashed world of Chiral. The recording of this track sounds a bit crispy, but intentional or not, it really fits this track. Teo’s vocals, clean, screams and grunts, are amazing. Yes, Teo even grunts a bit! After eight minutes there is a short moment of rest to go full-speed again towards the end of this amazing split. With these two tracks Chiral again delivers two masterpieces. Queen Of The Setting Sun will be my favorite between these two. I surely recommend this split between Ah Ciliz and Chiral to everyone who likes atmospheric black metal. These two bands are definitely worth to keep an eye on.